Decided to do another smoke shot. Amy and I both thought of wings as soon as the image opened…thoughts? 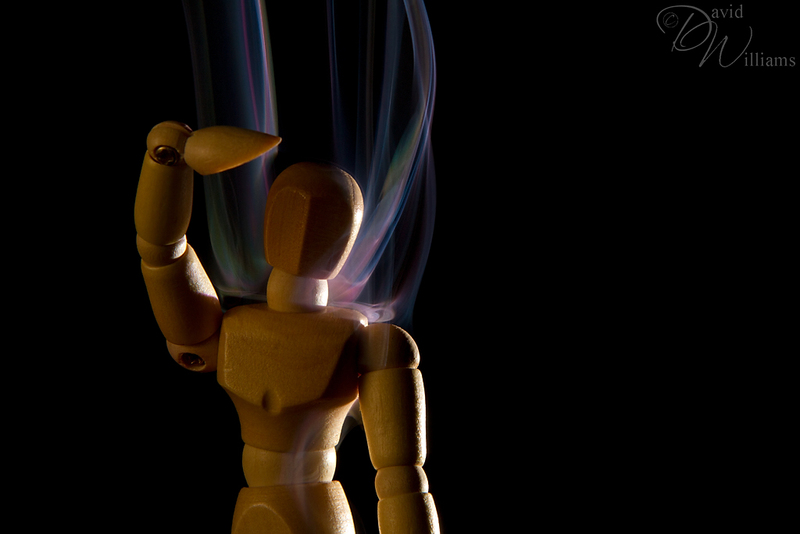 I have a few other ideas floating around (hehehe, had to say that) in my noggin for some smoke shots. 😉 Enjoy! Great shot David, I love the smoke shots so far! Thank you Jim, I have enjoyed them too! It reminds me of a cape. Its like he’s falling from the sky! Ohhh, I like…or perhaps parachute lines? Thank you for the comment Morgan. Cirque de Soleil!!! I like it, very very nice! Ohhh, I just watched a few shows on Cirque de Solei, have to love it! As always, thank you for the comment. Very dramatic lighting and great timing on the smoke. Nice photoblog, too. I remember when the Duotone theme was introduced and I knew somebody would do some great work with it. This is great – a wooden angel. Love it. I like it – I think you have found a new thing that you’re good at. When I first looked at it I thought about someone in a cold rain and then the sun hit them – you get that brief ethereal burst of steam illuminated by the sun. Thank you Mike, I love your take on this…very creative! !